I have been in the trade for a long number of years and I began when I was just 16 years old when I was fixing cars with my father. I started my own business at a young age called A & A Autos & closed it in 2008 before setting up Extreme Tyres in Worthing in 2008 where we focused on tyres originally before branching out into all repairs. 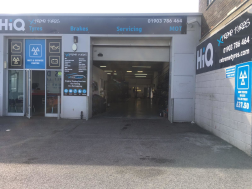 The business operates both garage and mobile services for customers convenience, and on those mobile jobs you will either see Luke Sayers or Mark Burgess. The team will tackle all makes/models of car & cater for all repairs, so whatever the issue Extreme Tyres will get you back on the road. I had to chase the whereabouts of the mechanic half an hour over the booked time slot. He arrived an hour later than arranged. Not sure if service was done as no documentation left that implied it had been. If forgotten please could you pick car up another day this week and do it. Used Click Mechanic 3 times now and have been pleased with all works carried out on my car GREAT SERVICE and so convenient. Everything went very smoothly; Luke was very thorough and, most importantly, in addition to the comprehensive checklist we were able to have a useful phone conversation. All went very smoothly, no issues, all fixed, all on time etc.